War has commenced against Steppenwolf and the forces of Dherain. The World Army, along with the Wonders of America (Green Lantern, the Flash, and Dr Fate), have attacked Steppenwolf preemptively, to ensure that he doesn't gain a foothold for another Apokoliptan invasion. The World Army is no match for Steppenwolf's forces (Bedlam, Beguiler, and Brutaal), and have been all but decimated in little more than an hour. The Wonders of America proceed to rescue whom they can, but Green Lantern takes the fight to Steppenwolf himself. Green Lantern has Steppenwolf in hand, but is attacked by Brutaal. The Atom tries to help, but is knocked out by Brutal, and then, he and Steppenwolf proceed to pummel Green Lantern until he moves no longer. Steppenwolf gloats his victory to a field correspondent, until Brutaal slices him in half and reveals himself to be Superman, who was thought dead, but now is in the thrall of Darkseid. Story - 4: If you've followed Earth 2 from its inception, this installment is a rewarding issue, especially as it's James Robinson's last. The world of Earth 2 hasn't had an easy go of things. It's survived an Apokoliptan invasion, being ravaged by the Grey, fire pits, and now, it has to contend with Armageddon in the form of Superman. It's a mind blowing issue if you've just picked it up cold, and that is for better or for worse. 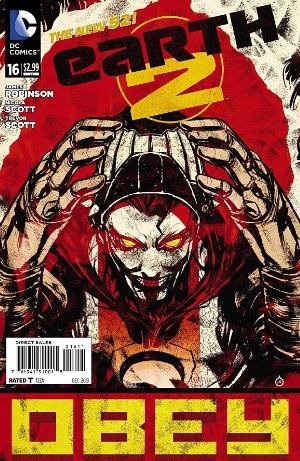 The better being that it's definitely a way to keep readers enthralled, as evil Superman is en vogue. The worse, of course, being that the book as been about war and destruction, with little else to fill in the gaps. Still, for the sheer weight of battle and hopelessness, it's a strong story. The world is once again at risk, and the best it has to offer cannot match Steppenwolf and his trio. When all seems lost, Steppenwolf is slain, but with Brutaal-Superman being under the influence (which I really hope isn't the case), it goes from seemingly lost to abandoning all hope whatsoever. The Wonders are shown to be so small in the face of what they're up against, particularly when Green Lantern haves at Steppenwolf. It seems like he'll make good for a moment, but Brutaal stops that, and as Green Lantern is powered by the Earth itself, it doesn't speak well of the world's chances. I though it was pretty obvious that Brutaal was Superman; we we're given a heads-up with Fury and the new Batman. I'm also not a fan of evil Superman, and there has been a wee much of Superman on the dark side of things this year, his 75th anniversary. There are currently three evil versions of Superman running around, and the one that is "good" is underdeveloped in comparison to his analogues. It's also the fourth time Superman has been Darkseid's thrall, and the umpteenth time he's been mind-controlled for evil purposes. That being said, I'm reading because I'm curious to see where it all goes. There's obviously a reader reaction to a perverted Superman that's selling, and DC is giving the readers what they're responding to. Let's see how deep the rabbit hole goes. Art - 4: Derenick reminds me of Keith Pollard, and who doesn't like Pollard? Solid, strong figures, with great splashes hear and there. He gets Kalibak's mocking grimace just right every time. Cover Art - 2: It's supposed to be Brutaal, but they did so much to obscure it that it looks like the Joker. Boo.